You must be a member of the Frankfurt Hiking Group to attend this activity. Would you like to join this group? I invite you to join a relatively easy hike mainly through forest with very pretty scenery along the way. The hike will start at Gimbacher Hof, Gimbacher Weg, Kelkheim, a car ride of less than 5 minutes from the train station. There we meet at the big board with the map of the surrounding area located between the entrance and exit gates of the adjacent camp ground and start the hike at 11:30 am. The hike as mentioned before leads primarily through forest paths. We pass first of all another neat forest restaurant (Waldgasthof Gundelhard) and then reach a game reserve featuring wild boar and deer. The trail continues to a small temple erected in honor of Karl-August von Cohausen in Protected content , who was director of the collection of antiquities of the Nassau family in Wiesbaden. He found and excavated nearby celtic defensive walls and came upon the remnants of an allegedly very high Roman watchtower of which unfortunately nothing is left. The hike continues through a very pretty pine forest, one of the northernmost in Europe. Close by we will find the socalled Hofheimer Bergkapelle (mountain chapel) which was erected in Protected content the citizens of Hofheim amidst the raging plague in the hope of being spared. 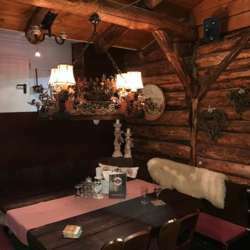 A few hundred yards further is a very nice Bavarian style restaurant, where friendly waitresses will serve our lunch in Lederhosen ! Afterwards we have the chance to climb the nearby Meisterturm, a 30 m high observation tower providing excellent views. Bypassing Gundelhard on the way back again, we shall take a different return path along fields which will provide us with a nice glimpse of the Bahai Temple of Langenhain we visited on previous hikes. A few more minutes through forest and we are back at Gimbacher Hof. In case folks from Frankfurt are willing to offer a ride, I would suggest you place a post to that effect here in order to arrange for a location and time to meet (maybe Frankfurt Hauptbahnhof). One final comment and request, If you need to cancel, please do so no later than 11:00 am on Saturday, Febr. 9 which has been requested by the Meisterturm restaurant. The train back to Frankfurt departs Kelkheim at 15:42.